These chips are suitable for filling the gap of packaging items of irregular shape materials like statues and machine parts to avoid damage. 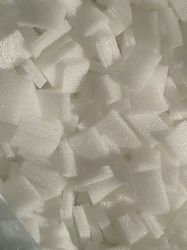 In order to process high quality EPE Chips, our professionals employ advanced machines and utilize quality tested polystyrene procured from the authentic vendors. It is possible to fill large voids as the product is light weight and extremely suitable for void filling, cushioning and its shipping cost, is minimized. Particles sizes are configured to pour freely and flow around any size or shape of an object placed in box / container. Hence, saves on custom packs & moulds as it provides cushioning to all the shape and size of any article. This EPE gap fills are highly shock absorbent and light weight. It’s easy to use and can be reused N number of time. Looking for Foam Fill ?